Bringing the most advanced technology to our patients, we recommend optomap ultra-wide digital retinal imaging as part of your comprehensive eye exam. expertise and optomap technology, optomap brings your eye exam to life. of your eye. Traditional viewing methods can be effective, but difficult to perform. They are also carried out manually without any digital record. 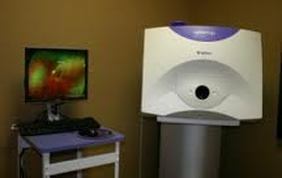 The optomap ultra-wide digital retinal imaging system captures more than 80% of your retina in one panoramic image. Traditional methods typically reveal only 10-12% of your retina at one time. The unique optomap ultra-wide view enhances your eye doctor's ability to detect even the earliest sign of disease that presents on your retina. Seeing most of the retina at once allows your eye doctor more time to review your images and educate you about your eye health. Numerous clinical studies have demonstrated the power of optomap as a diagnostic tool.